My first experience with Charles Dickens was in my seventh grade English class. Part of our required reading list was A Christmas Carol. To be perfectly honest all I really remember about the book is the index cards we had to make of words we didn’t know. As a bookworm I hate to admit that but what I do remember about the experience is the Geva production that we saw after reading the book. If you haven’t seen Geva’s production of A Christmas Carol, what are you waiting for?? Go!! If you have seen it, you are probably like me and have had the pleasure of seeing it on more than one occasion. So, when Breadcrumbs Productions approached me about hosting a performance of their production of A Christmas Carol, I was very excited…and extremely nervous. Could we actually have an event at Rose Hill at night in early December??? This would be a completely different use of Rose Hill, but historic house museums across the country are doing similar programs to engage their communities. With the staff and board behind this experiment, I agreed to partner with Breadcrumbs. When Dickens began writing A Christmas Carol in the fall of 1843 his career appeared to be at a crossroads. Despite early successes with The Pickwick Papers, Oliver Twist, Nicholas Nickleby, and The Old Curiosity Shop, his last two novels (Barnaby Rudge and The Life and Adventures of Martin Chuzzlewit) were not well received and sold very poorly. He was in debt and his wife was expecting their fifth child. With A Christmas Carol Dickens hoped to improve his finances and prove he hadn’t lost his touch. 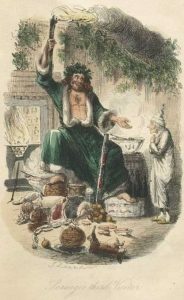 Some scholars even suggest that A Christmas Carol is an allegory of Dickens’ own life — a once successful man receives a final opportunity to redeem himself. Dickens’ publishers (Chapman and Hall) were not interest in the concept for A Christmas Carol. Instead, they offered to reissue a cheap volume of Dickens’ previous writings or to launch a new magazine with Dickens as its editor. But Dickens was persistent. Not only would he write the book but he would also oversee the editing, design and layout, and advertising. All Chapman and Hall had to do was publish the book. In exchange they would receive a fixed commission and all production costs would be deducted from Dickens’ share of the profits. Dickens hoped to earn 1,000 pounds from the initial printing. Despite the book’s success, once the expenses were deducted, he earned roughly 230 pounds from the first printing. Most of Dickens novels were published in weekly or monthly installments. Once each story was completed, it was published in a three-volume set. 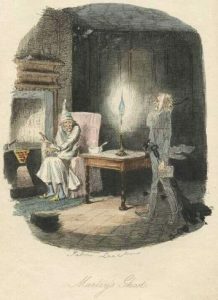 Unlike his other books, A Christmas Carol was not written in installments, and for the very first time Dickens completed a project as a whole. Fewer than 30,000 words, Dickens wrote A Christmas Carol in six weeks while finishing installments for The Life and Adventures of Martin Chuzzlewit. 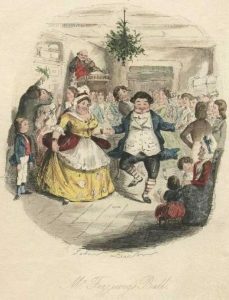 On December 19, 1843 A Christmas Carol in Prose. Being a Ghost Story of Christmas debuted. The book was bound in red cloth with gold embossing (the pages were even edged in gold). The original edition had eight illustrations (four colored plates and four woodcuts) by caricaturist and illustrator John Leech (1817-1864). Within four days all 6,000 copies of the first edition were sold. By New Year’s Day the book was on its third edition. The first shipment of A Christmas Carol arrived in Boston on January 21, 1844. Copies sold for $1.25. However, without copyright protections, pirated versions began appearing, with some selling for as little as $0.03 a copy. Dickens got the name for Scrooge while visiting Edinburgh in 1841. As he walked through a cemetery he found a tombstone for Ebenezer Lennox Scroggie. Apparently Dickens was quite taken by the inscription on Scroggie’s tombstone – “mean man.” He, however, misread the tombstone. Scroggie was corn merchant and the tombstone actually said “meal man.” The actual character for Scrooge was based on two men, miser John Elwes (1714 -1789) and scholar Rev. Thomas Robert Mathus (1766-1834). Rev. Mathus promoted the theory that sooner or later the population will be checked by famine and disease. Believe it or not doctors have debated what disease Tiny Tim suffered from. The final diagnosis is rickets and tuberculosis. Dickens would write four more Christmas books – The Chimes: A Goblin Story of Some Bells That Rang An Old Year Out and A New Year In (1844), The Cricket on the Hearth (1845), The Battle of Life (1846), and The Haunted Man and the Ghost’s Bargain (1848). Aside from being published around Christmas, these books had no connection to Christmas, unlike A Christmas Carol. 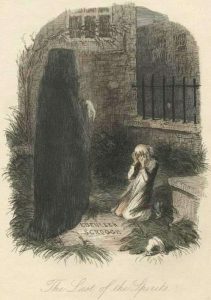 A Christmas Carol has become the most adapted of Dickens’ works. On February 5, 1844, just weeks after the book’s debut, three plays premiered in London – A Christmas Carol; The Miser’s Warning; Scrooge, The Miser’s Dream and A Christmas Carol or Past, Present and Future. By the end of 1844 there were at least 16 different productions in London. In the United States, A Christmas Carol or Past, Present and Future was performed at the Park Theatre in New York City as part of the 1844 holiday season. Over the years, adaptations of A Christmas Carol have included one-man shows, musicals, a mime production, straight plays, films, a ballet, operas, made-for-tv movies, public readings, radio broadcasts, sound recordings, graphic novels, and episodes of tv shows. Dickens found a second career giving public readings of A Christmas Carol and other works. To help raise money for the Birmingham and Midland Institute, Dickens agreed to give two public readings. On December 27, 1853, it took him three hours to read A Christmas Carol. Two days later he read A Cricket on the Hearth. His performances were so popular that a second reading of A Christmas Carol was given on December 30. Over three performances, nearly 6,000 people heard Dickens. Not only was this the first time that Dickens publicly read his books, but it was the first time that a novelist did a public reading of his own work. For the next fifteen years, Dickens traveled giving public readings. During that time he gave at least 128 performances of A Christmas Carol alone. Between December 1867 and April 1868 Dickens did come to the United States on a reading tour. The closest he came to Geneva was Syracuse . For more information about A Christmas Carol, read The Man Who Invented Christmas: How Charles Dickens’s A Christmas Carol Rescued His Career and Revived Our Holiday Spirits by Les Standiford and Inventing Scrooge: The Incredible True Story Behind Dickens’ Legendary A Christmas Carol by Carlo Devito. And I hope you will join us on December 3 “A Christmas Carol: Retold” at Rose Hill Mansion. We all know the story but does the story know us? Performances are at 6 pm and 8 pm. Tickets are $20 per person. Space is limited and reservations are required. Call 315-789-5151 for tickets or purchase online at brownpapertickets.com. This is a show you’ll not want to miss! Thanks for the great review of the writing of A Christmas Carol. Sorry to be too far away to have attended the Dec. 3 performance. Thanks too for keeping history alive and moving ahead positively.